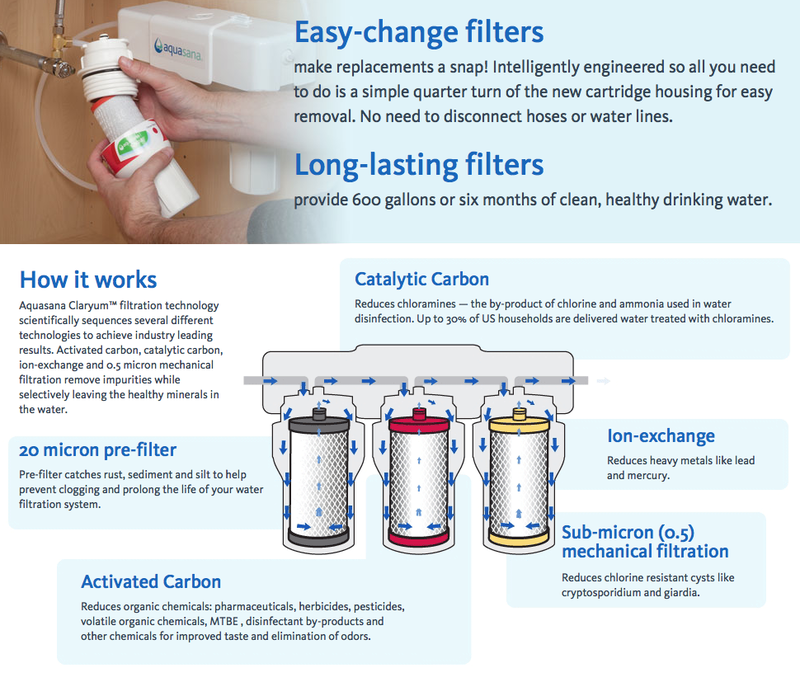 A few months ago I was sent a water filtration system from Aquasana. I live in a farmhouse that was built in 1858. We sit high up on the water table and most people love our tap water. I, however, detest our tap water. To me, it has a dry finish and it never truly quenches my thirst like bottled water does. For the longest time I would refill gallon jugs at the supermarket because at $.39/gallon it was very affordable but not so convenient. 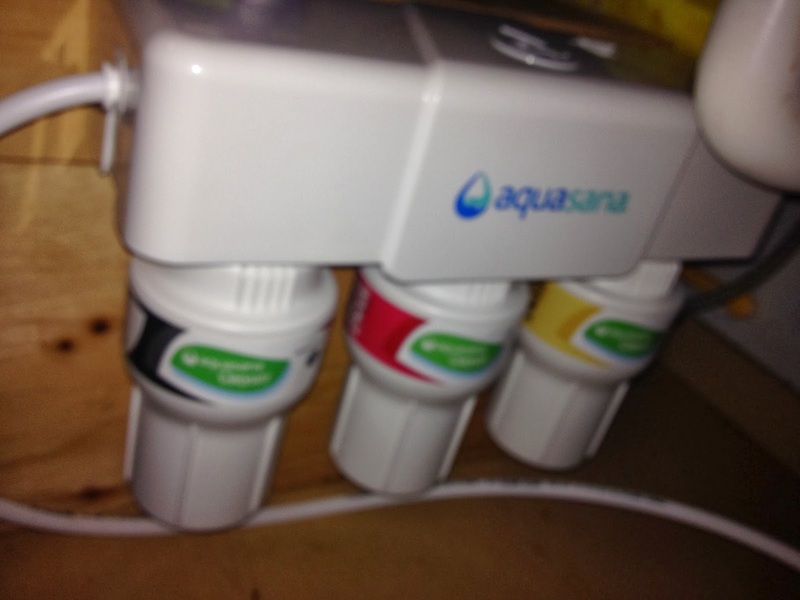 My husband thought I was nuts because he saw nothing wrong with our tap water---until he tried our Aquasana! He was impressed right off the bat. Me, well it took me this long to write about Aquasana because I honestly wasn't sold. I know it was more of my "dry water" than the unit but I still wanted to give it a fair assessment before I gave it my approval. 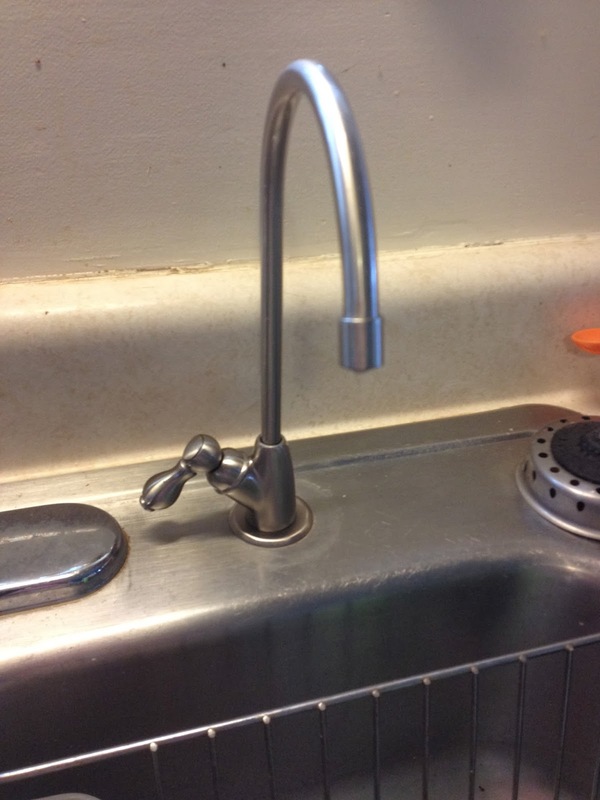 We already had a water sprayer attachment on our kitchen sink so installation was pretty simple. It did, however, take my handy husband about 1.5 hours to install because he had to build a shelf under the sink to attach the filters to. Under our sink was a mess but now it looks awesome!! How pretty is the brushed nickel faucet? In the 2 months that we have had the Aquasana installed, I can honestly say that I am very happy with not only the ease of accessing fresh, clean, drinking water but also with the taste. I drink A LOT of water and it's something that I am very particular about. It took some getting use to our water but now, I do not see any difference between our Aquasana water and bottled water from the store. I don't have much of a problem drinking water, in fact, I drink so much water that I go through about a gallon each day. There are so many benefits of drinking water so it's a no brainer. I use to worry about our tap water because we live on a working farm. The farmers spray the crops with pesticides and we don't go outside or open our windows when they are spraying. Its what I CAN'T see that scares me the most. I worry about pesticides leaching into our water supply. Well, I know I don't have to worry any more. 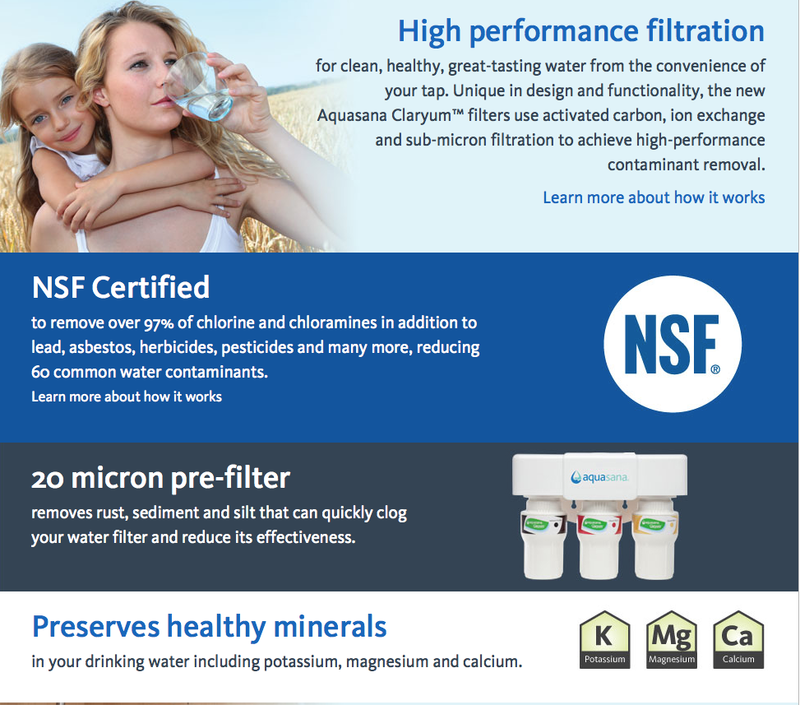 Aquasana is NSF Certified to remove over 97% of chlorine and chloramines in addition to lead, asbestos, herbicides, pesticides and many more common water contaminants. A set of 3 filters will filter approximately 600 gallons of water so at $64.99, you are paying $.1083 per gallon!! That is an absolute steal! If you want peace of mind and want to guarantee your family the cleanest, freshest water available, then don't hesitate to order an Aquasana system right away! What an awesome thing to have in your home. I love that the filters are long lasting. I have always bought bottled water because I don't trust my tap water. Even when we had the above the sink filter I still didn't trust it. I wonder if this filtration system would be better though since it has three chambers. I may try it out and like you said you can't beat the price, esp. compared to bottled water. This is awesome. We have been looking for something to help with our water issues. We are on well water and sometimes it isn't the best. Thank you for the review! That's the best investment we can get for our family. I've never seen a water filter quite like this one. very cool!